Our puppy Maya wasn’t well for last two weeks and was going through heat (oestrus cycle) and kept bleeding. 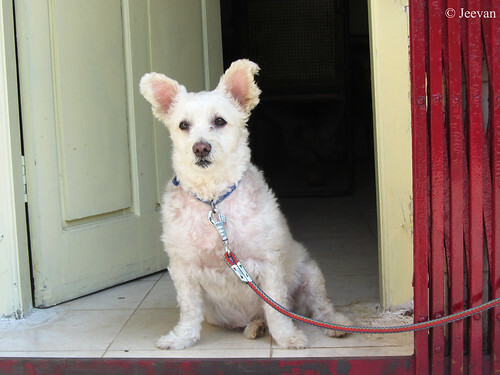 It’s a normal thing for any female dog to experience it twice a year, but Maya was not supposed to have it since her uterus was removed in 2014. But even after the surgery she had bleeding sometime and when inquired the vet, he said it’s perhaps due to production of ovum she continue to have the heat. So it didn’t matter us then and it doesn’t last than a week. But now it wasn’t the same and she continue to bleed for more than 15 days and it wasn’t red in color, but turns brown, yellow and white lately. Without delay we showed her to the vet and he gave antibiotic and tablets to stop bleeding but it didn’t help much and even injections couldn’t obey. He was sure it was infection since all other symptoms shows her normal… and she was active as well. But since we aren’t content with his treatment we showed her to another vet and on his advice, scan was taken on Thursday and it revealed that the uterus wasn’t completely removed and some parts continue to stay within her and that’s giving trouble now. She got sever infection now and pus has formed and that’s what continue to exit. Glad the infection doesn’t spread to the kidney but still we need to wait and see any improvement on her stage before going for blood test. The doctor has suggested that removing the remaining parts of the uterus could be the only solution for her to remain healthy and peace. Maya is 9 years old now and going for another surgery doesn’t sound bad though there isn’t an option if she wants to be stay happy. The situation wasn’t bad for her alone but also for us, who has to go through the odour and making certain things are clean around all the time. Mom has to keep checking her and clean the places she moves, even though we placed cloth at where she lies. It was indeed difficult time for us and was it coincides or not, I was glad for the decision of purchasing an air purifier last month keeping our puppy in mind. The Philips air purifier doing an amazing job right now (not because it was purchased from amazon) and with advanced HEPA (Nano) and carbon filters we experience odourless sleep during the night and breathe healthy air. I could obviously see and feel the differences before and after air purifier and I think now, I should have gone for this earlier. But it’s better late than never. Hope things will be normal soon and Maya stays healthy and happy along with us. stored in the mind folders. 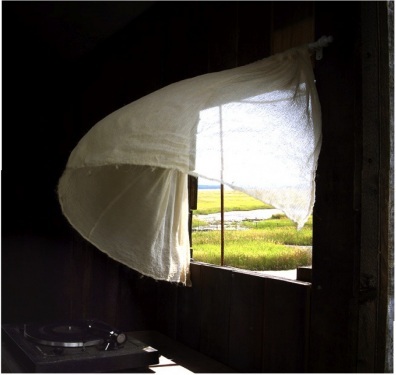 though open doors n windows. but vacation mood uplifts along. make feel tickle through air. 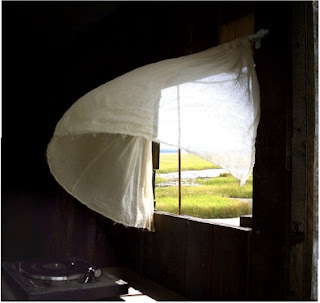 every time wind blows through. About 24km north of Chennai, Cholavaram Tank is one of the largest lakes around the city (following Puzhal, Sembarambakkam and Poondi) and the water from the rain-fed reservoir is drawn for the city supply, through canals to Puzhal Lake. 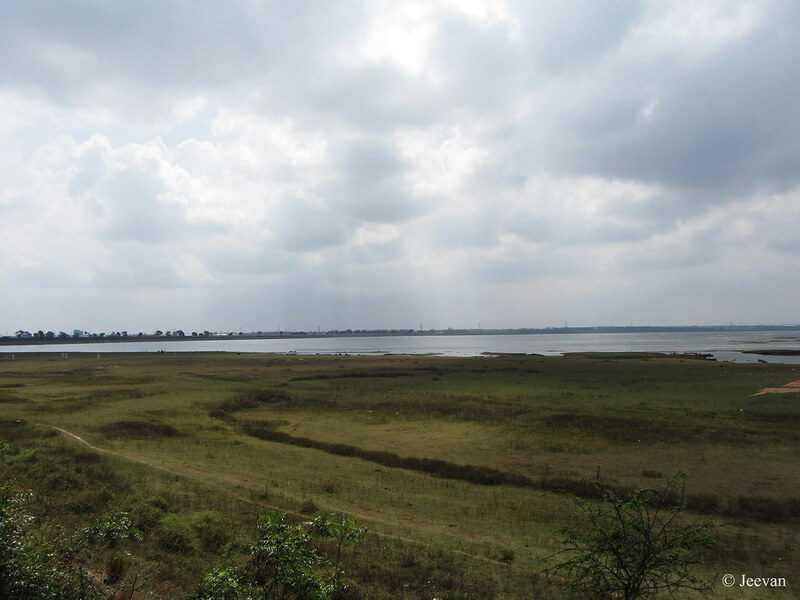 During 2015 historical rain and flood, the Lake reached the maximum capacity of 595 (mcft) out of 881 (mcft) and on 1st December 2015, the lake had an inflow of 423 (cusecs) and an outflow of 400 (cusecs). 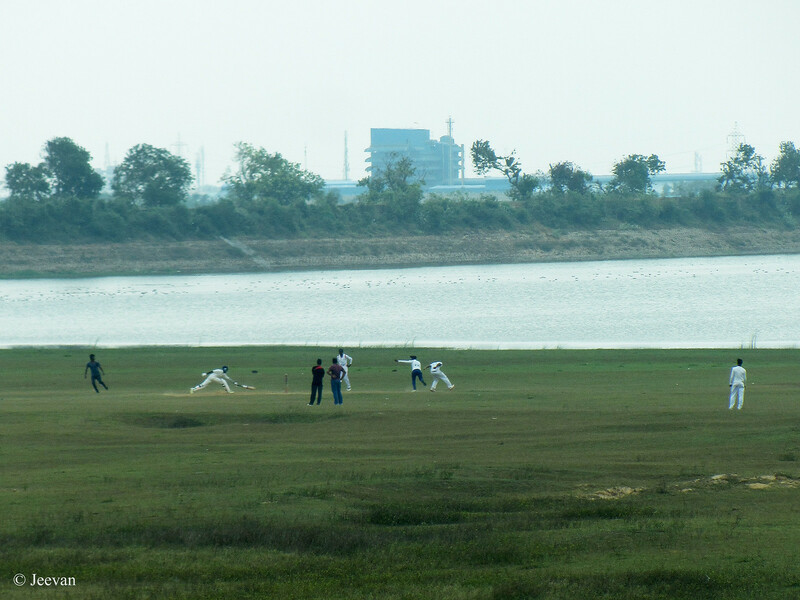 But now, due to failure of Northeast Monsoon, the level of water has went nearly down and its bed has almost turned playground, as you could see from the photos above (and below) – some youngsters are playing cricket on the grasses. 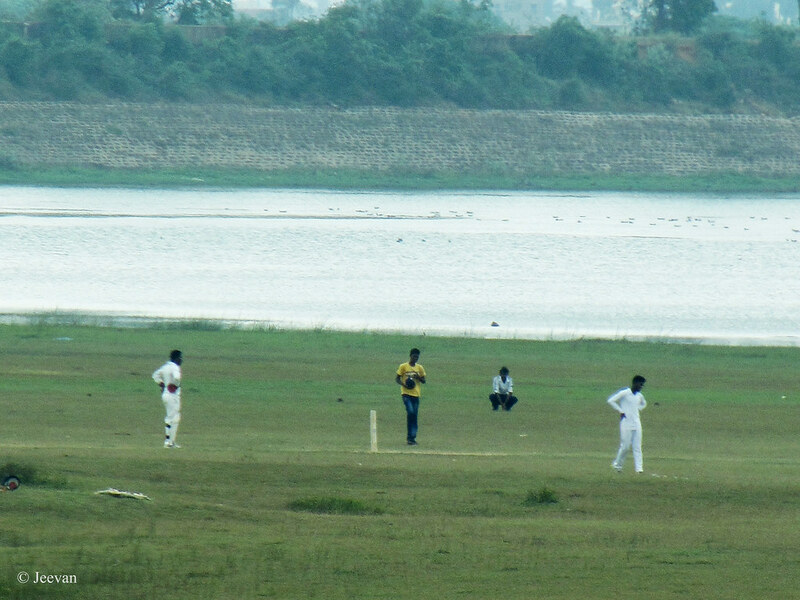 Apart lake, Cholavaram is primarily known for motor racing and racing events were conducted here from early 1960s to the late 1980s, before the Madras Motor Sports Club built a new track at Irungattukottai, near Sriperumbadur, Chennai. The race track near Cholavaram Lake was used to be an air strip during World War II and being a T shaped track it was modified to conduct racing on certain conditions. But having no idea where the race track was, I couldn’t check the place when visiting the lake on my way to Nagalapuram. 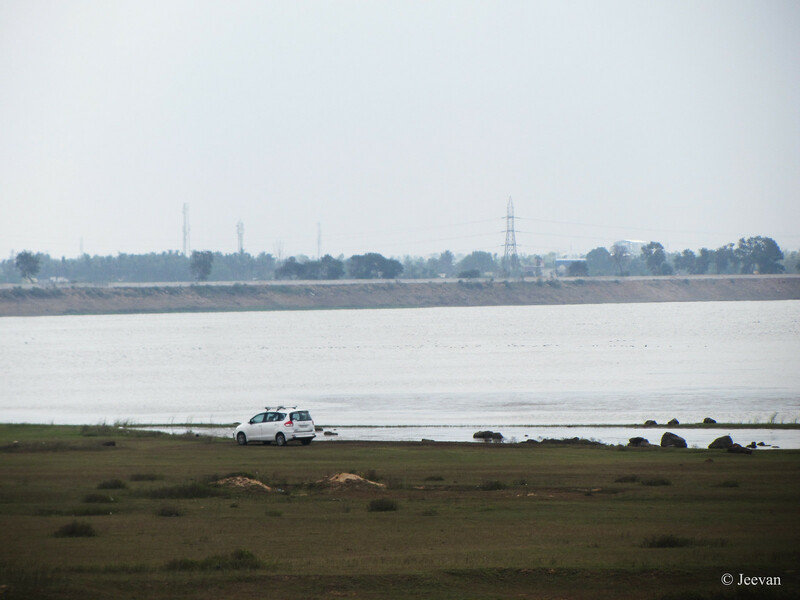 I actually decided to climb on the lake bank road from the south and get down at other end in north, but I missed the road that comes next to the Nallur toll plaza on NH 16, and could only check the lake from the other end where the surplus weir exit. A red soil road comes around the lake partially and only bikes and cars can travel from one end to another. As per agreement with Andhra Pradesh Govt. 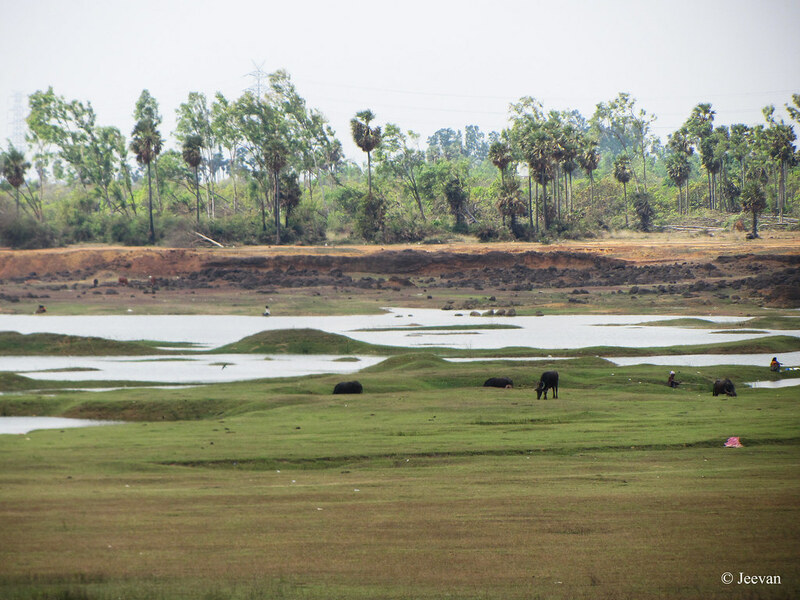 the Krishna water release from Kandaleru reservoir, is stored in Cholavaram Lake as well as Poondi reservoir for drinking purpose. 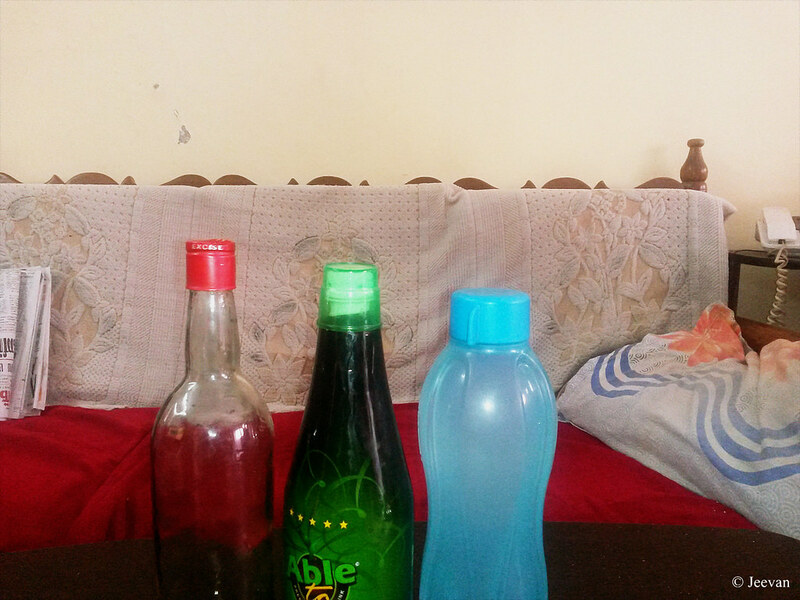 The red belongs to the bottle of mountain honey brought from Kodaikanal and green is my herbal drink (Able to)’s lid and the immune supporter is consumed for long time now. The blue is obviously the Tupperware drinking water bottle. 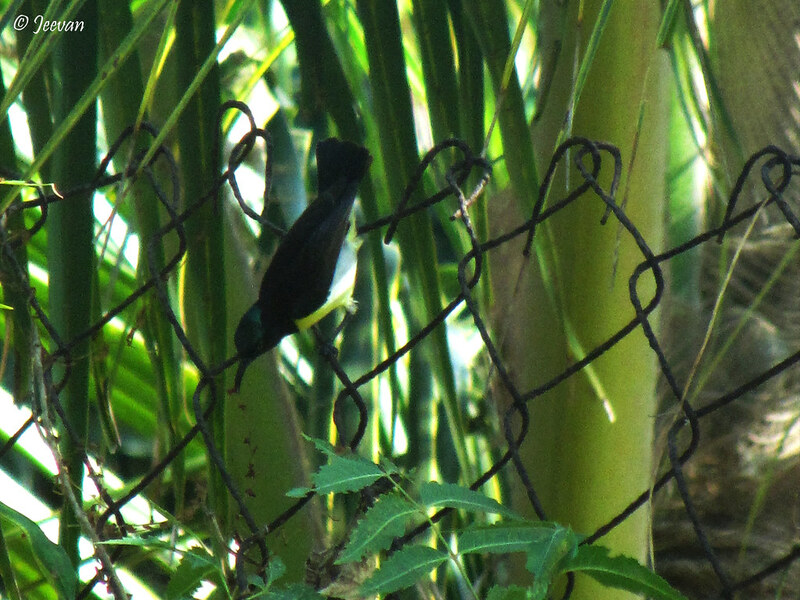 During an outing last year, on ECR and near Kovalam, I come across these tiny birds skipping here and there on the fence of a farm house. If you remember the Gloriosa Lily, the state flower of TN, I shot along with a fence? It was on the other side of the farm house I found these birds. The little birds have been very active then and I had to click number of shots to get these few shots on the birds. I actually thought, before observing the photos in detail, the birds (in photos below) belong to same species of birds. Though having a shade of yellow, the first two are Purple Rumped Sunbirds (male ‘n’ female) and the last one is a Common Tailorbird. The purple-rumped sunbird is an endemic to the Indian subcontinent and like other sunbirds; they are small in size and feed mainly on nectar but sometimes take insects, particularly when feeding young. The males are brightly colored, whereas females are olive above and yellow to buff below. 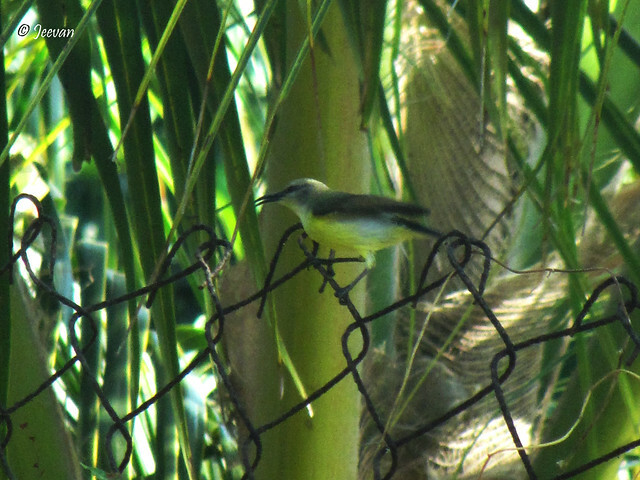 Males are distinguished easily from the purple sunbird by the light colored underside while females can be told apart by their whitish throats. Both the genders of the sunbirds are tiny at less than 10 cm long, and have medium-length thin down-curved bills and brush-tipped tubular tongues adapted for nectar feeding. Actually I was bit confused with the female Purple-rumped sunbird, which looked alike Little spider-hunter, but I was only sure after studying the detail. Below one is known as Common tailorbird. I only remember the name of the bird from the school text book and haven’t seen alive before, perhaps due to its tiny shape (size from 10 to 14 cm and weigh 6 to 10 grams) I couldn’t observe or captured well. 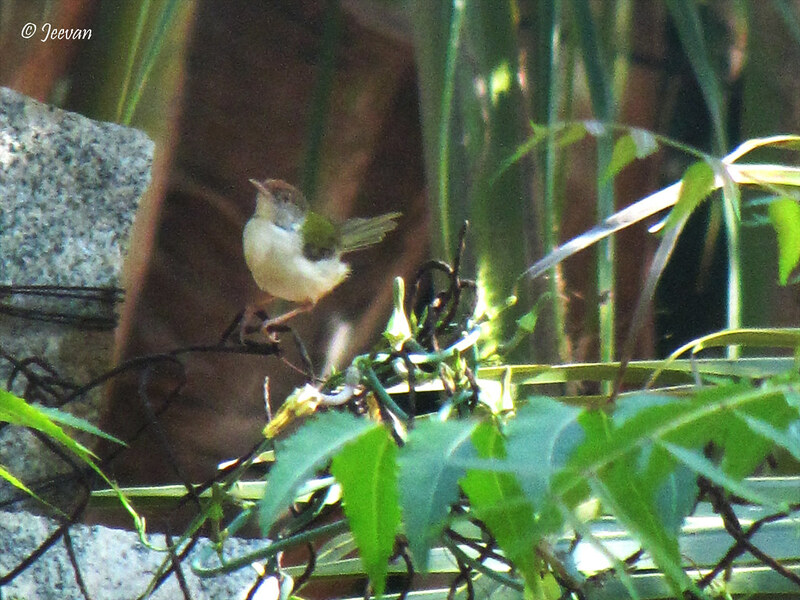 The common tailorbird is a songbird found across tropical Asia and it’s popular for its nest made of leaves sewn together. Although shy birds they are (a common resident in urban gardens) usually hide within vegetation and their loud calls are familiar and give away their presence. This passerine bird is distinctive in having a long upright tail, greenish upper body plumage and rust coloured forehead. 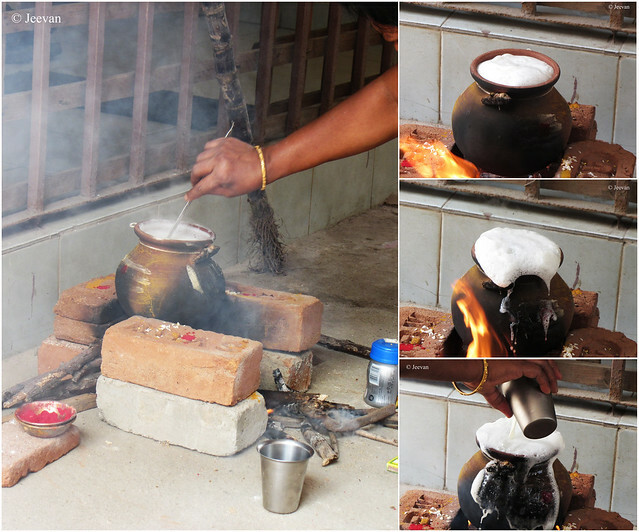 காதல் கொண்டு, வெறுப்பு கோபம் இதரவற்றை. 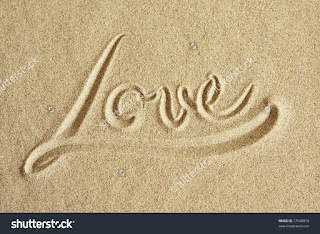 in its shadow, love repose. with love, hatred, anger ‘n’ others. by pouring love on diseased society. p.s. 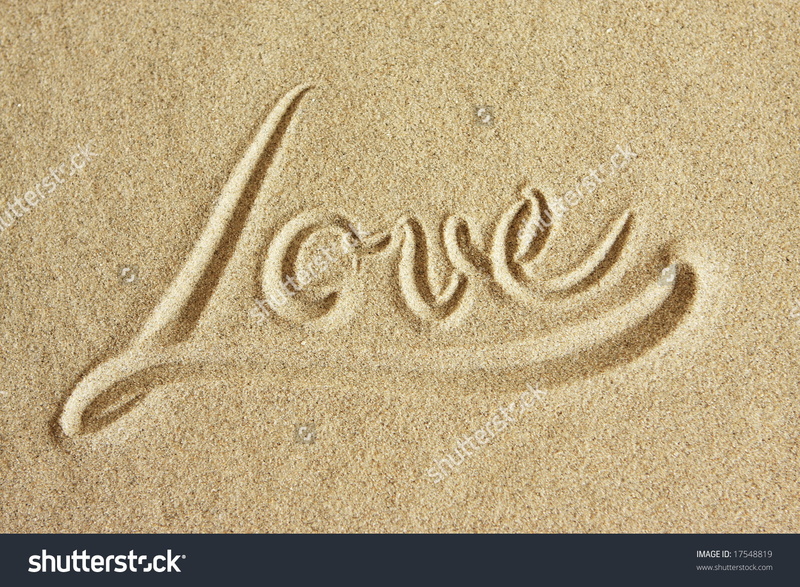 Beaches are my favourite pastime perhaps since we live close to sea and Elliot’s beach has many memories to share, and in our earlier days we visit the beach to enjoy the playground equipment’s like siding, seesaw, swings… installed at the beach sand. 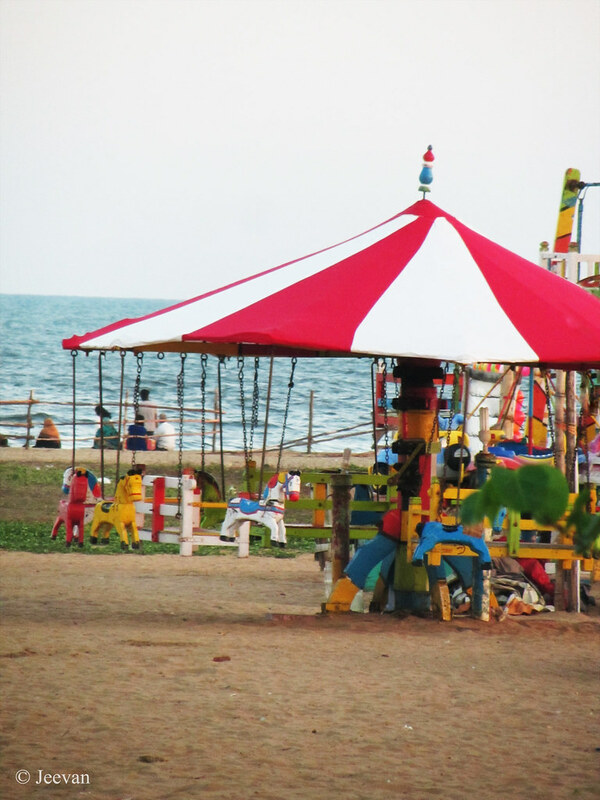 Elliot’s hasn’t been crowded then and only a part of beach was used much then, and the manually operated equipment’s like merry go around, ferry wheels aren’t available and also any kind of shops exists except the popular eatery Cozee, which is opp. to police booth. My late uncle is a friend of the owner, who’s a Singh (and he has also acted as Rajini’s friend in Basha) and he would take us there and get ice creams from the shop. Every time I pass the Cozee, the moment spent with my uncle at one of the tables there blink at my mind for few seconds. YellowBilled Babblers are a frequent visitor of our backyard in the morning and evening and the birds arrive as a group of 5 or 6 squeak like squirrels or mouse until they keep away. I remember following or seeing these birds from our days in apartment, with open vegetation in front of our home, the birds forage frequently on ground and trees. Lately, I see one of the babblers, a common resident breeding bird in Sri Lanka and southern India; keep hitting the mirror of a neighbour’s window and sometime the rear mirror of dad’s bike, perhaps seeing its own reflection thinking it to be some other. 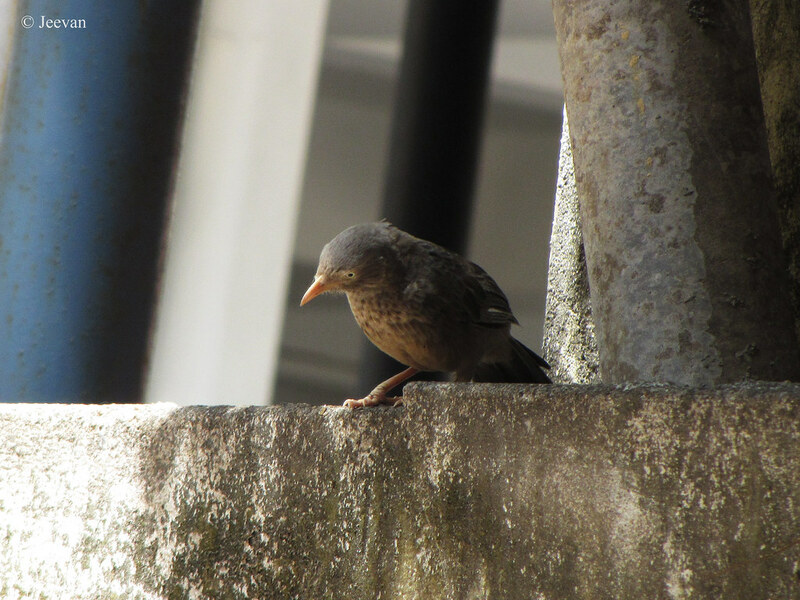 Not only babbler, I have seen bulbul behaving similarly and hope many other birds follow the same. 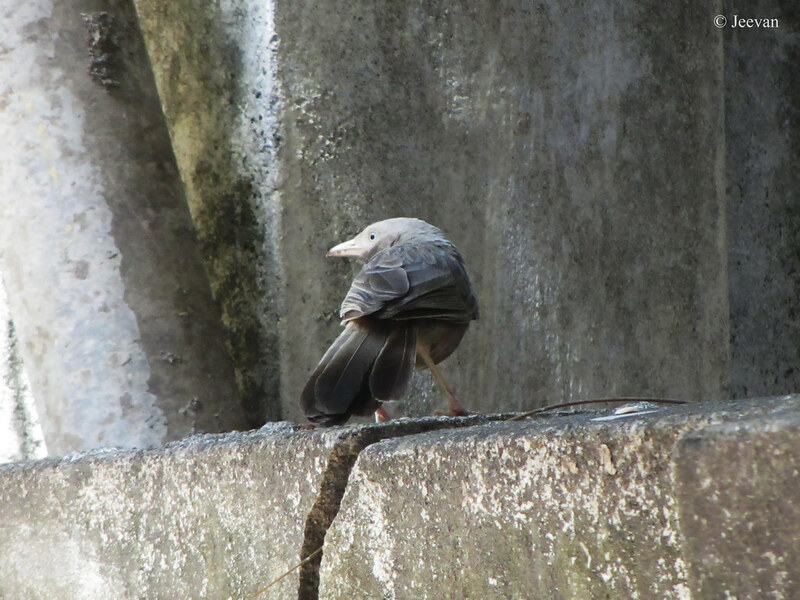 The babblers here were shot during noon sunlight in late August and they were digging on the corners of the compound wall for forage. 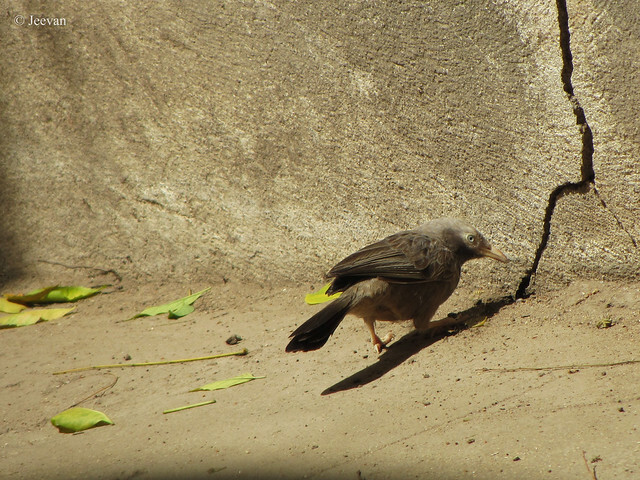 This species, like most babblers, is not migratory and has short rounded wings and a weak flight and is usually seen calling and foraging in groups. Unexpected has become the state of Tamil Nadu now, from the unexpected illness of former chief minister Jayalalitha and her sudden demise, and the grand revolution of youth andenforcement of violence and law on jallikattu, Chief Minister O. Paneerselvam’s (OPS) resignation and his open speech (last night) at the Marina beach, following his silent prayer at the memorial of Jayalalitha has kept the state furore. The almost people of Tamil Nadu is already in dispute once Sasikala, the close aide of Jayalalitha, sworn as general secretary of AIADMK and when she was selected as ADMK’s assembly president (which will let her to become CM) has intensified the against feeling. At this situation, O.Panneerselvam’s sudden visit to J’s memorial and his silent prayer for about 40 minutes and claiming that he was forced to resign the office of the chief minister has provoked the public and all social media started to flood with support for the OPS. It’s obvious who should be behind the scene and of course, it’s the Sasikala and team. Except being a close aide of Jayalalitha, she had nothing to do with public and political scenario, but her takeover of Jaya’s house and now office is approved by none including millions in their own part, AIADMK. It’s the upper level leaders and ministers of certain groups, who celebrate her for their need and deed, lead her to these posts which she deserves not. Nowhere in their long run of friendship had Jaya indicated her to take leadership after her or gave a little post in the party and in between she was expelled from the house by Jayalalitha after she come to know Sasikala’s family had misused in name of her. Things’ being like that how the party men go behind her and propose for the post of general secretary and now CM is shameful. While there are many true party men and seniors with experience at the 45 years party, selecting an inexperienced and corrupted to lead the Tamil Nadu will absolutely won’t be fair. More than an assistant of Jayalalitha, she hadn’t put front on anything or focused anywhere. But all of sudden she emerged as Chinnamma (small mother) and speakers of the party started to praise her for reasonless. Perhaps this inspired her to take bold step and before all, her family was back once Jaya breathed last, and thus forced OPS (who have been appointed as CM for couple of times by Jayalalitha during the difficult situation) to resign by giving pressure via his colleagues. If this was the scene even before she took oath as CM, we couldn’t imagine what kind of attitude the govt. would hold and the state of public if she became CM. There couldn’t be a limit for the unruly things and what has been achieved through the one man army, by Miss Jayalalitha, would be collapsed due to ineffective ruling. The Jaya’s demise continues to be a mystery even though the doctors reveal certain details, OPS has said to form a commission to enquire about her death. After the OPS opened up, the overnight meeting held by Sasikala with all MLA’s had removed him from the post of party treasurer, but he has said to take oath as CM, again, if people of Tamil Nadu wishes. 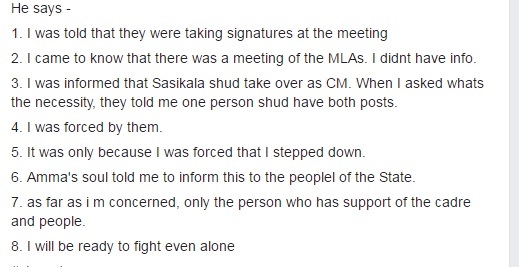 After the midday meeting held at the presence of Sasikala, once again, the 131 MLA’s (who supported Sasikala for CM) has been hijacked in buses to safest places or on tourism to keep them away or meeting OPS to lean their support. Things has been going on its own, and don’t know what’s gonna happen tomorrow where they are meeting the governor and request to form a govt. 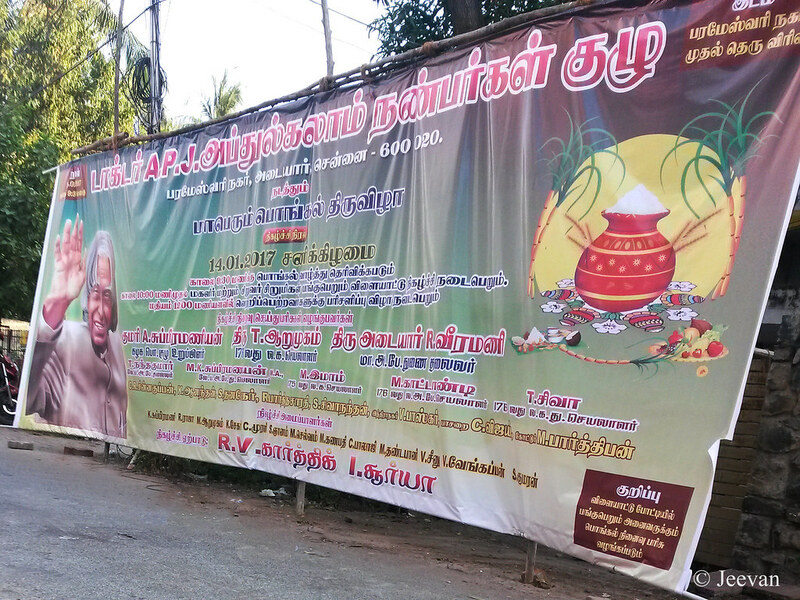 headed by Sasikala. But the overall support of Tamil Nadu is for OPS, including myself who admire his simplicity and down-to-earth attitude. Let’s hope for the best. Support OPS! Here’s RGB Monday to keep away your Monday Blues and make feel colourful and yet cheerful! And this Link-in feature invites your colourful photos with the content of RGB – Red, Green, and Blue. Please add your link-in at the comment section (along with your comment)and it will be mentioned at the bottom of the post. 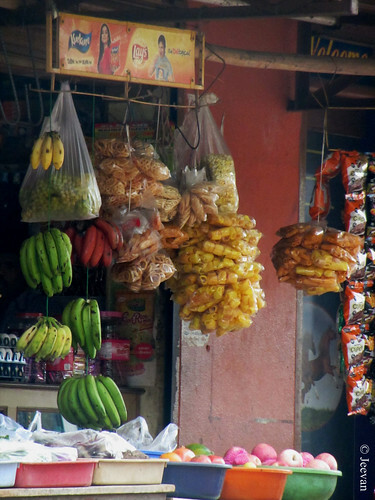 A colourful and yet delicious grocery shop on the outskirt of Chennai. I shot the picture at a small town next to Cholavaram on way to Periyapalayam, in north of Chennai. The shop seems to sell adequate for a small towns alike and what hangs over are fruits and locally produced snacks. But the baskets beneath has what I looking for the post, the RGB colors. I always like these small kinds of shops than malls, where we get anything that a household needs and we could move friendly with the shopkeepers and was adjustable in many ways. I have purchased a lot from the grocery shops alike from the childhood, and having one adjacent to our house we could buy anything without paying but they used to have a note and collect money at the end of a week or month. And we could communicate socially with them while purchasing and they could be trustworthy because many a time our house keys are given at them to give back to family members if one exit house. Last Sunday we went for an outing and long drive up to Nagalapuram trekking base, across the border of Tamil Nadu to experience mountains and checking couple of dams. 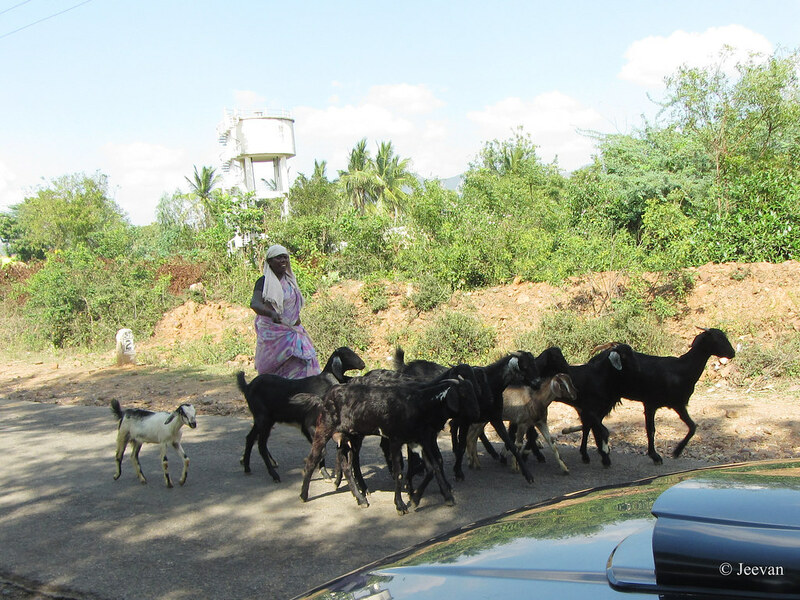 Once crossed the Periyapalayam, the landscape turned quite rural and into the state of Andhra, I come across many cattle’s and some in groups where drove by farmers. 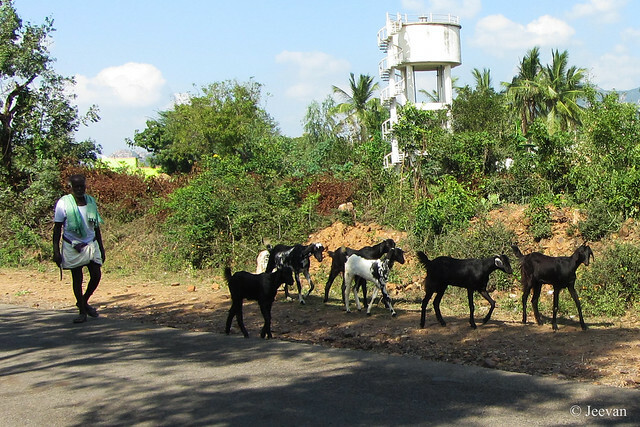 During our lunch halt near a village, on the roadside, we find little groups of goats drove by the villagers perhaps on their way to or from grazing. 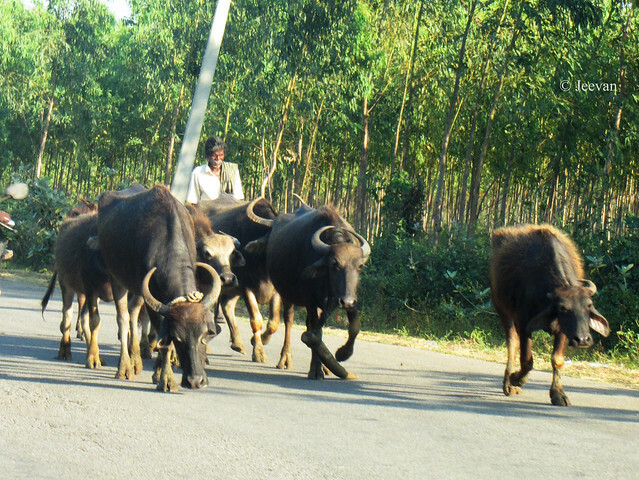 On our way back and close to evening, the buffaloes (below) seems to drive back to home... the picture was shot near Uthukkottai, the border town of TN-Andhra. I know it’s late by two weeks to post on Pongal, the harvesting festival of Tamils, but it’s better late than never. I think you all know about the youth revolution that took centre stage following the Pongal and though it wasn’t an easier task for people to come forward to protest for their rights and protection of bulls, the entire week was like an extension of Pongal with the voices of slogans indirectly, alongside supporting the traditional sports, emphasis the wealth of bulls and farmers. We couldn’t think of Pongal keeping away the farmer and it was farmers festival overall but we have the reason to celebrate as they are our life savers, producing food for us. Pongal festival brings happiness for farmers and Jallikattu is a part of the celebration and we got back the traditional sport in right manner. 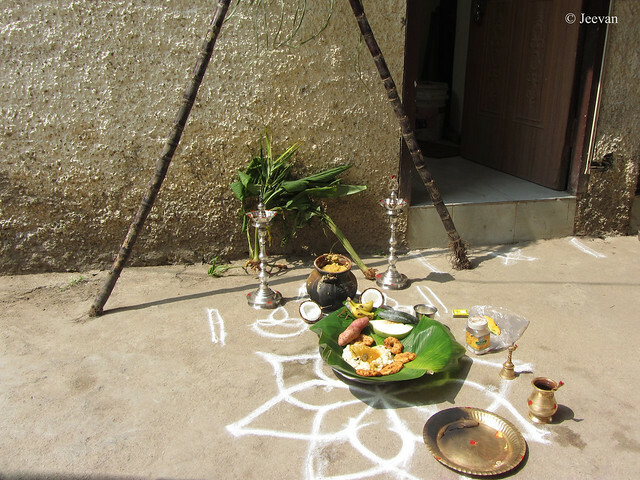 Coming to the post, this year’s Pongal was different for me and was able to feel the mood more than latter years. Though we celebrated Pongal in the traditional way, where we lit firewood’s on the outside of the home and made Pongal (boiling of rice and milk) in the mud pot, the Pongal event conducted in our street by the backstreet boys was really uplifting. They created a friends group in name of APJ Abdul Kalam and conducted Kolam contest, running race for different age groups and couple of fun sports. 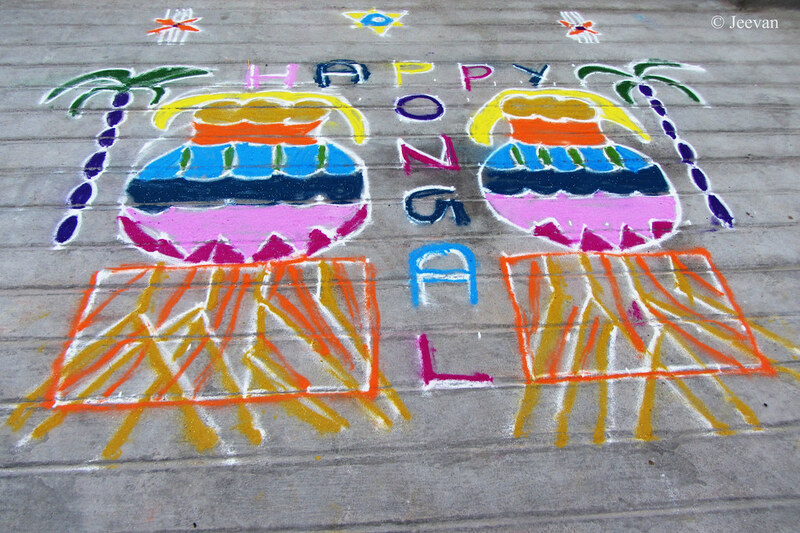 The event was started from the eve of Pongal and the Kolam contest happened at the night itself but they came to capture our Kolam (along with the others) only in the morning and we unknown who’s the winner. The boys and girls participated in the races and won gifts from the organisers and what really impressed was all showed up in traditional dresses. 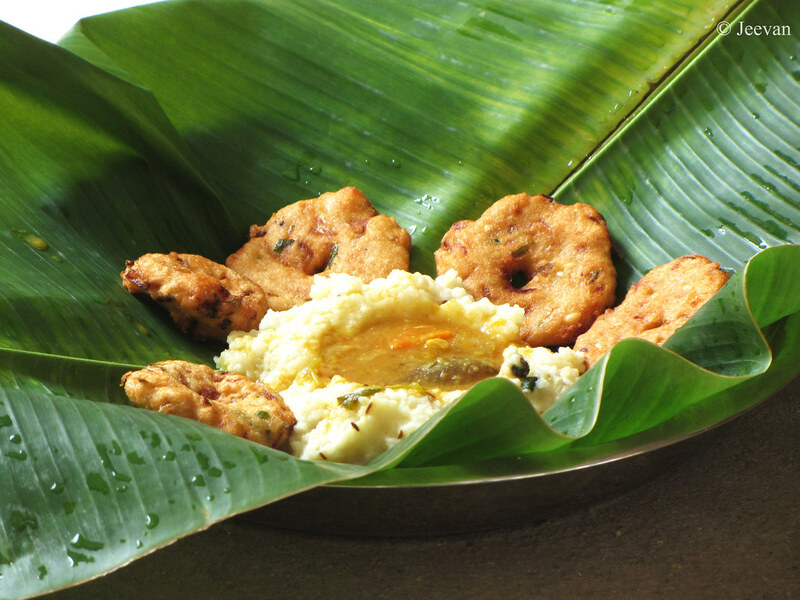 My favorite "ven pongal and vada"